“Concealed firearm” is a loaded or unloaded handgun which is carried upon a person in such a manner as not to be discernible by ordinary observation (NRS 202.3653), this includes in a carried bag/purse. Concealing a firearm without a permit is a felony. Nevada is not a constitutional carry state. Take an eight hour concealed firearm permit course approved by the sheriff. Out-of-state or military training does not qualify. Residents: Apply to the sheriff of your county. Non-residents: Apply to the sheriff of any county (for example, Clark County routinely takes 90-100 days to approve a concealed firearm permit). Visiting America/Nevada? You can open carry! Illegal immigrants cannot possess firearms and non-citizens generally have their permit applications denied. Only one application is needed for every firearm you own and you do not have to list each firearm individually; the 'revolver/semi-automatic' distinction has been abolished as of 2011. The issued permit will cover every handgun you own or acquire. The sheriff shall issue a permit to any applicant who is qualified to possess a handgun under state and federal law and must do so within 120 days or deny the permit for lawful reasons (NRS 202.366). In rare cases, temporary permits may be issued for delayed applications. 2. Not a felon, a fugitive, a drug addict, have never been adjudicated mentally ill or committed, not an illegal alien, nor have been convicted of a misdemeanor crime of domestic violence (NRS 202.360). You must also: Demonstrate competence with a handgun by successfully completing a course in firearm safety approved by a sheriff in this State; or successfully complete a course in firearm safety offered by a federal, state or local law enforcement agency, community college, university or national organization that certifies instructors in firearm safety. The course must include instruction in the use of handguns and in the laws of this State relating to the use of a firearm and must meet the standards of the Nevada Sheriffs’ and Chiefs’ Association. Out-of-state permits or military training/discharge does not qualify as in other states. Note: Make sure the sheriff you are applying to approves your specific handgun course. 1. You have an outstanding arrest warrant. 2. You have been declared incompetent or insane or have been have been admitted to a mental health facility within the last 5 years. 3. You have been convicted of DUI within the last 5 years or committed to rehab for drugs or alcohol within the last 5 years. 4. You have been convicted of a violent misdemeanor within the last 3 years or are a felon. 5. You have been convicted of a domestic violence crime or have a restraining order against you due to domestic violence. 6. You are on parole or probation or you have a suspended felony against you within the last 5 years. 7. You made a false statement on your application. Your permit will be suspended or revoked if the sheriff finds out about you being disqualified by anything in Part 4. Do not sign your application until you are directed to so by a sheriff's employee, unless you have the form notarized. Be sure to provide a passport style color photo of you from the front. One may be taken of you by the sheriff. You will also pay fees of not more that $60 to the sheriff (FBI fees will be extra). The sheriff will fingerprint you. You will be 'run' through the National Instant Criminal Background Check System, the Central Repository for Nevada Records of Criminal History, and through the FBI database (NRS 202.366). Be sure to carefully review and follow all the instructions on the application form. Refer to the sheriff's instructions for how each office handles the actual application and fingerprinting process, which may vary slightly from above. If your application is denied, you may appeal in district court for the county in which you applied (NRS 202.3663). The process can take up to 120 days, especially in Clark County. Be prepared to wait and open carry in the mean time. Unless suspended or revoked, a permit is valid five (5) years from the issue date. Plan the renewal in advance, as in Clark County, renewal application processing can take between 90-120 days. Complete the process as above for applying for a permit, except the fees are $25 and the class is four (4) hours (NRS 202.3677). Check the information on your card! If it is incorrect, call the sheriff's office immediately. You must carry your permit and proper ID (such as a driver license) when carrying a concealed firearm. Both the permit and proper identification must be presented if asked by a peace officer (no duty to first inform). A violation is an infraction punishable by a $25 fine (NRS 202.3667). Note that this does not require you to carry your concealed firearm permit when carrying openly. Nevada does not require you to notify a peace officer that you are carrying a firearm, but out of courtesy and for your own safety, if you are being detained, you may choose to inform the officer you are lawfully carrying a concealed firearm. If your permanent address changes (i.e. you move), you must notify the sheriff in writing within 30 days. If your permit is lost, stolen, or destroyed, you must within 30 days, submit a written statement to the sheriff that your permit was lost, stolen, or destroyed and pay a replacement $15 fee. Should you recover your original permit, you must return the duplicate permit and notify the sheriff in writing within 10 days (NRS 202.367). For permits issued on or after July 1, 2011, any owned handgun, semi-automatic pistol or revolver, can be carried concealed by a permittee. If the permit was issued before July 1, 2011, the permit will list the specific authorized handguns that can be legally carried. There is no legal opinion whether that requirement for pre 7/1/2011 permittees would still have legal force or is actively being enforced. All 'listed weapons' permits will expire on July 1, 2016 and licensee's renewals will cover any handgun the permittee owns. As a licensed concealed carrier, is my personal information public record? No. Bare statistics, such as how many permits have been issued are permissible public records, but personally identifying information is only available to law enforcement officers/agencies in their official duties (NRS 202.3662). Can I get a temporary concealed firearm permit? In theory, yes. Practically, they are issued very rarely to those who have taken the course of instruction and applied for a permanent permit, usually when a clerical error delays the issuing (or denial) of the permanent permit beyond the 120-day deadline. Issuing temporary permits is solely at the discretion of the sheriff and the expiration date is set by the sheriff. Most Nevada permittees qualify for an exemption from the requirement to undergo the background check (as they've already been vetted) when buying a firearm from a dealer and paying the $25 fee. The Form 4473 is still completed and a copy of the permit is needed for the dealer's records. For permits issued on or after July 1, 2011, the permittee would be exempt from the Brady Bill background check when buying from a licensed dealer. Permits issued before this would be invalid because the ATF decertified the state after it was revealed some sheriffs were not complying with certain renewal requirements required to qualify for the exemption. This would not qualify to avoid the duty to obtain a private-sale background check if the universal background check initiative (Ballot Question 1) passes in 2016 or if those background checks would still be free. Recognized states are set by the Nevada Sheriffs’ and Chiefs’ Association pursuant to state law. If you hold a recognized permit on the reciprocity list, and you do not reside in Nevada, you may legally carry a concealed firearm in Nevada. 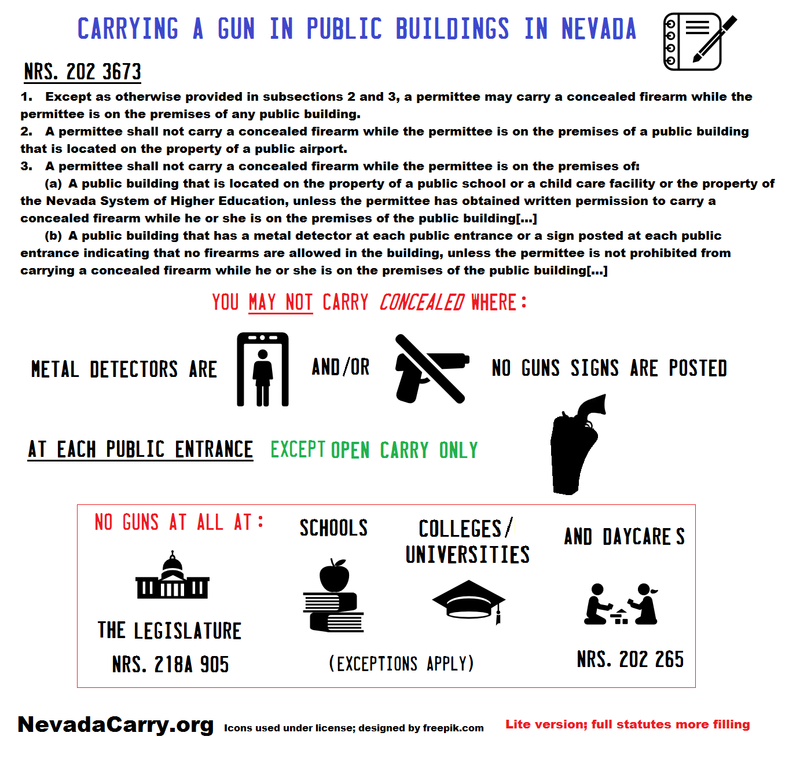 Nevada residents must hold a Nevada-issued concealed firearm permit to carry a concealed firearm. Non-resident or out-of-state permits are not recognized for Nevada residents. There is no specific exemption for military members or their spouses. If you have recently become a resident of Nevada and hold a non-resident or out-of-state permit, there is a 60 day grace period if the sheriff of your county has not issued you a Nevada permit. For example, if you hold a concealed firearm permit from Arizona, but you live in Laughlin, it would be illegal to carry a concealed firearm in Nevada using an out-of-state permit. Please note, that the requirements for recognition of non-resident permits have recently changed and some states may have been added or dropped. Holders of a non-resident concealed firearm permit must abide by the same restrictions in carrying a concealed firearm as they would as if they held Nevada concealed firearm permit (NRS 202.3688). On the plus side, Nevada's concealed carry laws are among the most relaxed among the states that require a permit. You can carry in bars and drink alcohol (don't get intoxicated), in cars, and signage doesn't have the force of law. Where is concealed carry illegal? VA hospitals/facilities including federal veterans' cemeteries (carrying). Firearms are banned in "a building or part thereof owned or leased by the Federal Government, where Federal employees are regularly present for the purpose of performing their official duties" and includes essentially all parts of federal court facilities (18 USC § 930). 'No weapons' signs must be posted at federal facilities in order for someone to be convicted (but you may be arrested). On National Park Service lands (National Parks, Monuments, etc. ), the only restrictions on firearm carry are state and local laws (54 USC § 104906). If you can carry legally outside the park, you can carry legally inside the park. The park buildings (visitor centers, offices, etc.) are still federal facilities and off-limits to firearms. Red Rock National Conservation Area is 'special' and does not allow loaded firearms (no magazine/clip inserted, no rounds attached to the weapon or in the chamber). It is not a part of the National Park System and is managed by the Bureau of Land Management. More in this article and sign the petition here. National Forest lands in Nevada have no ban on the carry of firearms. On the premises of a public school, on the property of the Nevada System of Higher Education, or a child care facility without written permission of the college president, school principal, or head of a public child care facility, including in the parking lot (NRS 202.265). The legislative building or wherever the legislature is conducting business (NRS 218A.905). The secure area of an airport (for instance, employee-only areas or past the TSA checkpoints). Inside a building of a public airport (open carry is legal outside of the secure area). The Legislative Counsel (the state legislature's attorney) found in this opinion that open carry is legal in public areas of public buildings. Concealed carry is legally restricted in more locations than open carry is. Per NRS 202.3673(4)(c) Permittees who are employees of a public building may carry a concealed firearm in that posted building, however, the state preemption laws, allow local authorities to make their own policies regarding firearms. So while a permittee may carry legally inside the building, they can be disciplined or fired if they carry in violation of their employer's ban on carrying firearms. If the permittee has received written permission from the person in control of the public building to carry a concealed firearm, they may do so, but permission is rarely granted. Employees in a public building (except a school) can carry concealed, but are not exempted from their employer's policies which may ban firearms. Do I have to obey ‘no guns’ signs on private property? ​Can I carry concealed on private property or in my home? Can I carry concealed at the mall? Can I carry concealed at a casino? Yes, legally you can carry on private property (except private schools and daycares) even if there is a 'no guns' sign. However, most indoor malls and casinos will ask you to disarm or leave the property if you are discovered. All they can do is ask you to disarm or tell you to leave. Failure to do so would be a trespassing violation. Can I carry concealed in a bar? Can I drink while carrying? Do I need to carry my blue card with me when I carry my gun? No. The 'blue card' system has recently been abolished. A blue card was never a license to carry a firearm, simply a receipt of registration. Concealed carry requires a concealed firearms permit. Does Nevada recognize my state’s permit? I have a non-resident permit from another state, but I live in Nevada. Can I carry concealed? No. You must have a Nevada permit to carry a concealed firearm if you have reside in the state, but new residents have 60 day grace period until they must have a Nevada permit to carry concealed legally in Nevada. I'm from Arizona or another constitutional carry state and don't have a permit. 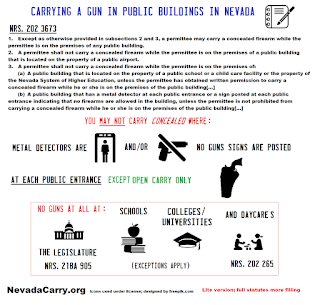 Can I carry concealed in Nevada? No, you must have a concealed firearm permit in your home state or a non-resident state that Nevada recognizes, or one from Nevada. Open carry does not require a permit. Concealed carry is better than open carry because surprise will work to my advantage. The idea behind this is that an openly carried weapon may make the carrier a primary target of the criminal/terrorist. The concealed carrier would blend in with the crowd, and then draw at when it was to their advantage. This assumption is generally false in the absence of evidence that an openly carried weapon leads to victimization. Abundant evidence is available that open carry is indeed a deterrent to crime. Concealed carry lacks that deterrent factor. The 'gray man' element, appearing unremarkable and blending in with the crowd, only has application when one may be specifically sought out; such as in the case of a police officer. The desire not to be spotted carrying a firearm or otherwise identified typically comes from the police influence in the concealed carry training world. The advantage of concealed carry lies in the fact that it may be possible to carry in places where open carriers would be shunned or asked to leave, such as casinos. Legally speaking, the advantage is with open carry, yet due to modern sensitivities, the discreet option of undetected concealed carry would prevent any debates with anti-gunners or objections to having the weapon on private property where the owner/management might prohibit it. Also, given one’s choice of dress or activities, concealed carry may be more appropriate. The debate is largely a matter of taste and environment. A citizen carrier with anti-gun customers or friends may want to protect themselves without alienating others. Some may feel uncomfortable carrying openly. Whatever the choice, it is a personal one and not to be judged or criticized. Open carry and concealed carry each have their own unique advantages and disadvantages; neither is inherently superior to the other. Both methods complement each other and allow for flexibility in self-defense. Training? Contact your local gun store or range for recommendations or ask your sheriff’s office for a list of certified instructors that they recognize (but not endorse). I'm all for the 2nd Amendment especially in consideration or terrorist & narco-terror type activities. I believe that open carry has the potential to create a hostile reaction in limited circumstances when around some mentally unstable people & drug users. If in a public place & the place was attacked I tend to think that the terrorists if they noticed would choose to take out the openly armed citizens & unarmed. I would rather appear & act as a innocent unarmed scared citizen & then when I have the advantage take the terrorists out as deemed necessary. Wrong. Have you read anything we've written on open carry? Your "belief" defies all logic and experience. In reality, open carriers are the most likely to just be left alone and not need some "advantage" of surprise. My personal experience comes from openly carrying in the Las Vegas area for most of the past 25 years, long before it came back into vogue. The writer's disdain for property rights is disturbing. If a "no firearms" sign is posted it should be respected, just as a "no trespassing" sign should be honored. Gun owners have no special exemption from decent behavior. I saw no disdain, simply a clarification that no laws are broken for failing to see or obey a sign. We are big proponents that anti-American "no gun" businesses do not deserve our business. Correction to Part 1: Non-residents are usually denied permits, even though the law allows them to apply. Non-citizen residents (think "green card") are shall-issue, the same as citizen residents of the state. Correction to Part 4: There is no need to bring a photo. Indeed, they will not accept it if you do. They will take your photo and fingerprints as part of the process. While on the subject, they will provide extra fingerprint cards to those who request them, for mailing to other states for other permits. The nominal fee is less than $15 extra. Yep, I'm a green card holder and I had no issues ! Do i have to register my firearm in order to carry it openly or concealed legally? If you buy a handgun you must complete a background check at a place such as a gun store or other that has a federal firearms licence. I've done it twice with no issues for my two guns. You should get approval as long as you are not a nut or have any criminal background to speak of. You just fill in the form, pay the fee and wait a couple days for the check to come back. Then they'll give you the gun and you can take it home. Question here, if you'd allow - I'm a non-Citizen/legal immigrant (Green Card) BUT also a non-resident of Nevada. How does this work? As an example, Utah issues permits for "non state resident" "legal immigrants (Green Card);" but Arizona requires that for "legal immigrants (Green Card)" to be issued a permit, they need to be resident of the state. I have a domestic violence misdemeanor in 2006. Completed course by the court and never been in trouble since. Am I still eligible or should I not even bother? Where can I find the application for a Nevada non-resident CCW permit? No search engine I use turns anything up. The Clark County Police Records and Fingerprinting office refuses to answer the phone. If I hear that recording again, I'll run screaming from the room. Did you find out?. I am interested in obtaining my Nevada CCW. I already have my California. CONFIRMED! Blue Card Records Destroyed!